PHILLIPSBURG, WILLEMSTAD - The Kingdom Council of Ministers approved on October 2nd, 2015 the proposal to appoint Ms. Maria C. van der Sluijs–Plantz LLM as member of the Board of financial supervision Curaçao and Sint Maarten (Cft) upon recommendation of Sint Maarten. Maria van der Sluijs–Plantz has her roots in Sint Maarten where she is also active in the business world. At present she is living in Netherlands. She has lived for years in Curaçao, after which she completed her academic training in the Netherlands. Maria has an economic and legal background and extensive administrative experience as CEO in international business. She is specialized in international mergers, acquisitions and buy-outs. Maria van der Sluijs-Plantz was Vice Chairman of the first Corporate Governance Council of Sint Maarten. At present she is active as a member of various supervisory boards, non-executive director and supervisory director of various organizations. The Board of financial supervision Curaçao and Sint Maarten consists besides Chairman Prof. Dr. Age F.P. Bakker, of drs. Alberto Romero upon recommendation of Curaçao and Mrs. Sybil M. Dekker upon recommendation of the Netherlands. The board is complete again with the appointment of Mrs. Maria. C. van der Sluijs-Plantz. 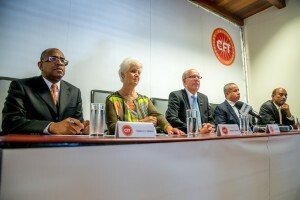 Early December the Cft will make its regular visit to Curaçao and Sint Maarten in its new composition. The intention is also to make a work visit to the Netherlands next year to get acquainted with relevant institutions.